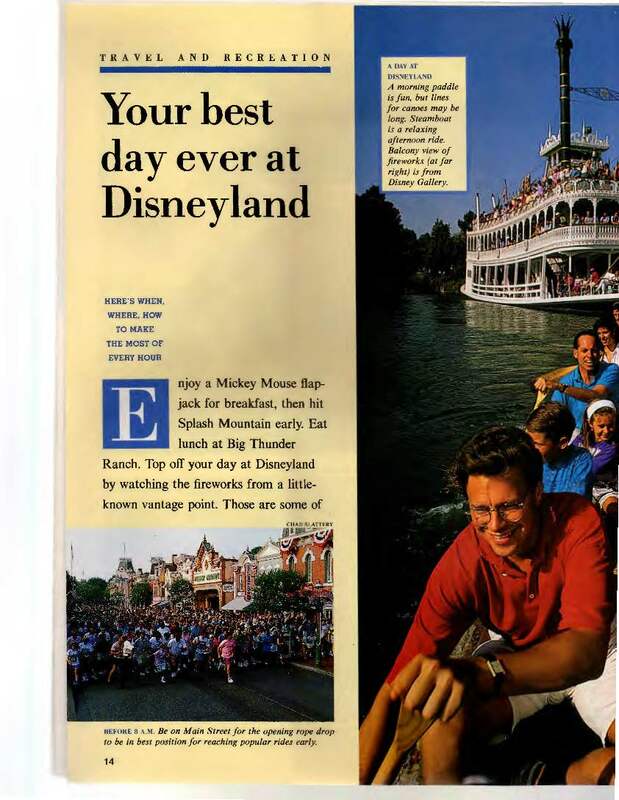 My in-laws (the actual physical people, not the Mouse-in-Laws) found a Sunset magazine from 1992 with a fabulous article about Disneyland. It has all kinds of helpful tips and such. Now 1992 is my college era. I graduated from high school in 1991 (so yes, I’m either “that young?” or “that old?” depending on your perspective ;)) and I went to college and grad school in the Midwest, so I lived in the Midwest for 8 years and basically missed the 90’s. However, in 1990 and 1991, I went a lot, so this article was particularly poignant for me. For realz, people--check out the hair on Canoe Guy! Now the 90s weren’t as unfortunate for hair as the 80s (so let’s be real, nothing will ever beat 80s hair. I’m positive that the hole in the ozone layer was made significantly bigger by all of the Aqua Net from those mile-high banks) but this guy is definitely stylin’. 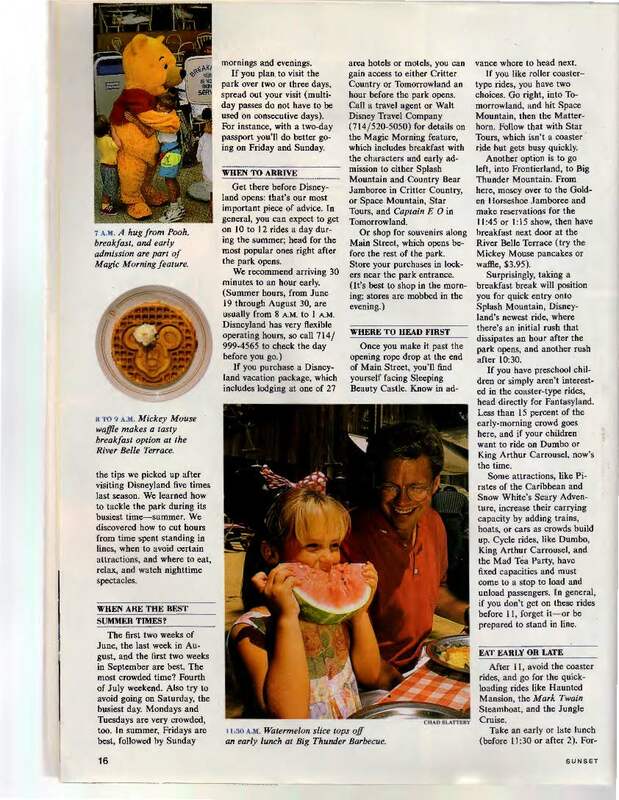 The article advises being there at rope drop (something I haven’t done yet) and recommends the “Mickey Mouse flap jacks” (also known as PANCAKES ’round these parts). No, there isn’t half of a canoe you can paddle–that’s actually where the magazine picture was split. And what’s with the skirt of the woman on the right? And there’s the guy with the hair and glasses again. According to the article, they visited the park “five times” which clearly makes them experts. 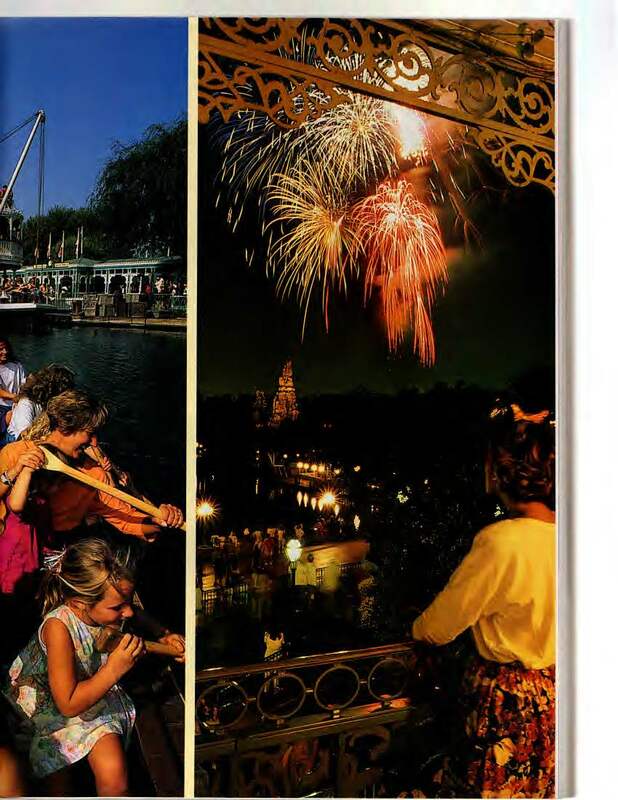 And according to this page, their biggest piece of advice is to get there 30-60 minutes before the park opens. Which again, I’ve never done, and seems a bit extreme–but then again, no fast passes back then either. Don’t miss Disneyland’s newest ride–Splash Mountain! Apparently an hour after opening but not 10:30 is good time to go. If you’ve scoped out the whole park 5 times, that is. Kids were not immune to bad taste. Check out that fanny pack. Also I love the water on the bottom right. That area is now Downtown Disney. Did you know that dinners at the Blue Bayou Restaurant run from $13-$18.10? Let’s just say that they are no longer $13-$18.10. And speaking of money, it’s gonna cost you $27.50 to get in, so budget wisely! And at the end of the day, don’t forget to catch the fireworks! There are over 250 of them, and the show lasts approximately 6 minutes. The best vantage point for both the fireworks and Fantasmic!, the newest nighttime show, is on the balcony in from of the Disney Gallery. Which is no longer the Disney Gallery. And finally, top off your evening with the world famous Main Street Electrical Parade! What a joyous day at Disneyland :). I always love reading old magazine articles! The last one I saw was more sobering though – it was a National Geographic from the 60’s showing an Afghanistan with brand new buildings and women in knee-length skirts going to work. Not to harsh on your article though, it’s definitely good for a smile 🙂 I’ve had several “kids” at stores trying to get me to try on new high-waisted pants and I tell them “No thanks, I wore them the first time they were popular!”. haha! You’re definitely lots younger than me! I graduated in 1983 and had some awesomely huge, teased and sprayed (Aqua Rock baby) hair. Man I’m old! If I can find it, I’ll have to dig up my 1983 Disneyland grad nite photo. That would be good for a laugh.